Congratulations on passing your SPHR exam Ben. Using the HRCP study material, I took the SPHR exam and did not pass. In my opinion the HRCP practice tests do not prepare you for the SPHR. The test questions are tailored more for the PHR. They definitely need to fix that. Material on the SPHR exam was definitely not in the HRCP. I next used the SHRM Learning System and learned that their practice tests are formatted much like the HRCI practice tests and the actual SPHR exam. Material asked on the SPHR exam were definitely in the SHRM LS but not in HRCP. I successfully passed the PHR using the SHRM Learning system. I will definitely think about purchasing your study material when I study for the SPHR. Hey, Sharon! Thanks for sharing your experience. The thing I learned (and that I’ll be really digging deep into on my followup article) is that no test material prepares you for the test. I’d put forth the idea that it wasn’t the SHRM materials that prepared you, but the confluence of the HRCP and SHRM materials that you studied, forcing you to broaden your understanding of the topics. I received an email yesterday from someone saying the exact opposite of what you shared: She took a SHRM prep class and said the exam looked nothing like what she studied in the SHRM learning system. After this test window SHRM won’t provide materials for the PHR/SPHR anyway, but still a great comment. Thank you so much for sharing. Thanks Ben. I agree. Using different study sources will broaden your understanding of the topics. 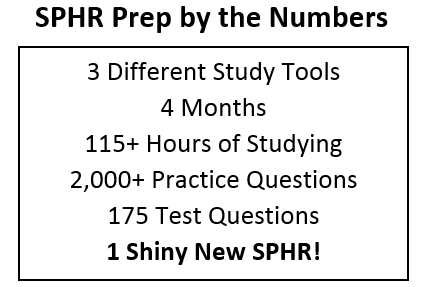 I think the HRCP manual is a good source, but the practice tests are not advanced enough to prepare you for the SPHR. That is my next dilemma upon studying for the SPHR (which material to use)? I am glad you will provide study material. Thanks for your help. Congrats Ben!!! That’s awesome! Do you think your tips would also apply to the PHR? Congratulations on passing your SPHR! I have taken the SPHR 2x, the CP 2x, and the SCP once. I am scheduled to take the SCP in July. I have used the SHRM LS, SHRM Web Class, Bogardus and Reed, SPHR for Dummies, studied for countless hours. I am becoming discouraged. I have spent at least $4k on study materials and taking the test. Never in my life have I failed something so many times. However, I can truly say that I have learned so much, but not enough to pass the actual exams that matter. Hi Taylor I respect your resiliency. Keep striving as it’ll pay off. Please post your testing success as I suspect they are forthcoming very soon. Anyone here taking the SHRM CP/SCP exam this Dec ’16 window? Yes; took the SHRM prep course for the SCP exam and can honestly say “I didn’t feel the course prepared us enough!” I studied a minimum of 20 hrs a week from Sept. to Jan’s test date and was blown away at the exam. I haven’t received my results in the mail but remain optimistic to retake in May. My fellow classmates also agreed that they guessed on 30-40% of the exam and had no idea what they were taking. One mentioned, “10 mins into the exam I was wondering if I was taking the SCP exam or something else.” Also, questions on the exam that were no where to be found in the SHRM 5 material books. Very unsettling.